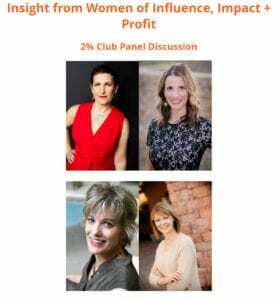 Part of my message at today’s Conscious Connections panel “Insight from Women of Influence, Impact + Profit” was “Success is an inside job.” This was/is a hard learned lesson and speaks to the need for personalized attention when growing as an entrepreneurial-minded leader. I/we need this kind of help. That’s why I fill the role of “creative partner” for others. And why I heavily invest in personal-professional development myself while involving advisors and team members (especially my “A-list“) for added perspective. The interesting thing about being on a panel for me (any speaking gig, really) is that I spend so much time preparing and then I (have to) let it go. Especially if I don’t show up with notes in hand. It’s just going to be whatever comes out of my mouth. And hopefully that experience is just as good as the one I planned. What has been most surprising about being an entrepreneur and scaling your business? What are the 1-2 key things to which you attribute your success? In preparing for speaking, I try to craft in writing what I would like to say. So I thought it would be fun to provide the answers I wanted to give today–the ones I had painstakingly crafted (with some inspiration from Jennifer Lawhead and a lot of coaching with communications angel/phenom, Jenn Kaye). I may have touched on these points or said them differently. I probably added a bunch not captured here. And hopefully I said the spirit of this–in so many words. Lots! No shortage of surprises. Frankly, that the best path is my own. So often we’re bombarded with all these messages about what success looks like and the formulas for how to get there plus quite frankly our own expectations and assumptions. I call BS. I had to learn that I didn’t need to follow any of that–at all or to the letter. The surprising thing has been I needed to accept that I had to find my way of doing things–and I had to know and understand my strengths and limitations to make decisions as a leader about how I was going to fill those gaps. Taking an approach that allows me and others to work in our unique genius zones has allowed me to hit a major revenue milestone (on top of the 2% Club requirement) last year–while working a lot less than most entrepreneurs I know and staying fulfilled in the work I do vs. burning out or being overwhelmed. It’s a personal journey and I’ve crafted my business as an extension of myself–not through a “program” but in a way that’s more respectful to myself and more in alignment with who I am. So doing that–gently, strategically–I’m better poised to succeed. And I’m not beating myself up or trying to fit myself into a round hole. I’ve learned we suffer by comparison. When I look at what someone else is doing and the success they are having, instead of beating myself up, I have to remember that I’m comparing my insides to their outsides. And more often than not, things are not always as they appear–although with my core value of authenticity, I would like them to be! Invested in Client Success – They feel it, it’s palpable. I’m driven by the idea that people–clients, employees, vendors, partners–deserve to be seen, heard, understood, and cared for. As a creative partner, I want them to be successful–as they define it. (That’s part of “Success is an inside job.”) This extreme focus on relationships is why our clients are happy and why they refer us. All of that translates to success. 2. Shameless Trust/Delegating – I don’t fall into the trap of thinking I have to do it all myself or no one can do as good a job as I can–or any of the other thoughts that cause leaders to be ineffective. I surround myself with people who have complementary skills, a willingness to help, a deep commitment to service and relationships, are self-guided–and I share the responsibilities with them. Nothing is created alone is as much a leadership principle for me as it is a business truth. Asking for help in filling the gaps and sharing the load–sometimes to shameless degrees by external standards–is a key factor in my success. I’d love to hear your comments and answer any questions. If you were there in person, what stuck with you the most? How was what you heard different? In Q&A, the page I mentioned as an example about the concept of repelling clients to “stack the deck” in terms of setting boundaries can be found here. And you can get the gist of “branding-as-repellant” from Root+River here. In closing, I’m incredibly grateful to moderator and conscious leader Kristi Hall and my fellow panelists today, Kate Seastone and Emily Soccorsy. I also appreciate Dr. Susan Wilder, who is also a member of 2% Club and could not be with us today.